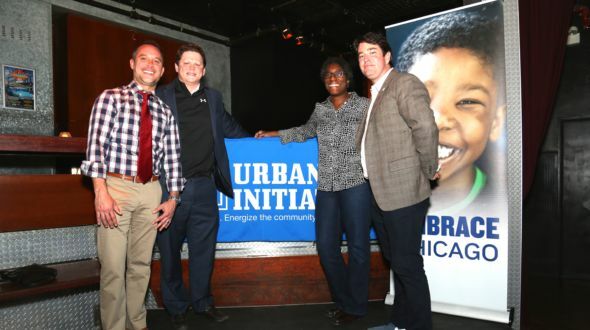 On Thursday April 14, Urban Initiatives hosted its first ever “Night Out” at Sidetrack. 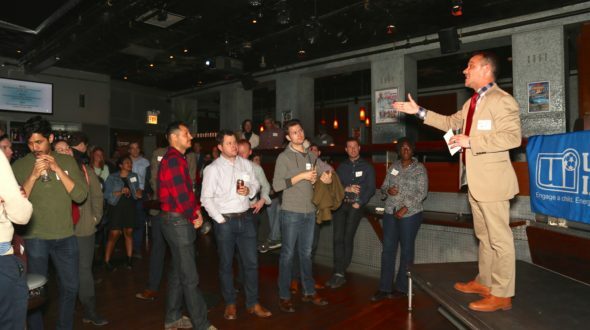 The event brought together members of the LGBT community and served as a way to introduce Urban Initiatives’ sports-based youth development programs to the LGBT sports leagues and the larger LGBT community. Host Committee member Leslie Henry kicked off the night by introducing how Urban Initiatives uses sports to create safe spaces for kids and to build stronger communities in the most underserved areas of Chicago. She remarked that Urban Initiatives and the LGBT sports leagues share the same goal: to use sports and teamwork to build and enrich communities while cultivating individuality in a safe and welcoming environment. Guests were joined by Kurt Jones, the Principal at Libby School, one of Urban Initiatives’ oldest partner schools. As a longtime supporter of Urban Initiatives and friend of co-founder and Executive Director Jim Dower, Mr. Jones offered personal stories of how he has seen Urban Initiatives transform the lives of kids in Libby School as well as within his own family. To close, Board Member Patrick Croke spoke to the power of Urban Initiatives’ programming and offered a heartfelt appeal to the guests to make a gift, volunteer, or reach out to staff to learn more about Urban Initiatives. Special thanks to Jason Burch, Todd Connor, Patrick Croke, Patrick Crosson, Yusef Garcia, Zachary George, Chris Hamilton, Leslie Henry, Kurt Jones, Patrick Lannon, Darren Reisberg, Michael Segobiano, Brooke Skinner Ricketts, Rev. Stan Sloan, and Britt Whitfield for serving on the Host Committee. Many thanks to Art Johnson, Jose Pena, and Brad Balof from Sidetrack for partnering with Urban Initiatives for this event.